Vacation Packages, Canoe Rentals, & More! 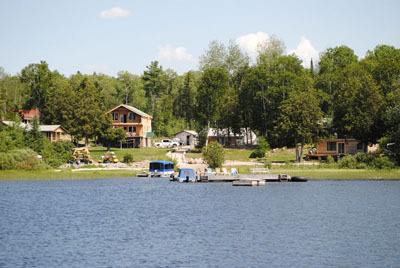 Mowat Landing Cottages is located at the road’s end, on the banks of the Montreal River, in beautiful Northern Ontario. We offer family-friendly cottage rentals in an ideal location for your getaway. With plenty of canoe rentals and fishing adventures around, there’s always something to do! A camp that you can drive directly to, miles from the nearest built up community. Powered by a generator that runs from early morning until late evening. running water, private bedrooms, private decks and plenty of room. A peaceful place where fishing and good times abound. Visit our remote lakes and fish for Lake, Rainbow & Speckled Trout and Pike or try our river for Pickerel (Walleye), Perch, Northern Pike, Whitefish and small mouth Bass. The drive out Hwy #558 (Mowat Landing Rd.) provides you with the opportunity to see our wilderness as God intended it and wildlife galore. Enjoy the majestic moose feeding along the shores of the Montreal River. Listen to numerous song birds in and around the Resort. The scenery is beautiful and relaxing. Breathe in pure, refreshing air. Join us at our northern getaway. Fish for Speckled Trout, monster Pike or Splake at our walk-in Lakes. View nature virtually untouched by industry and over population. We offer sixty-eight Kilometers of river fishing on the majestic Montreal River, also twenty-eight miles (four hundred and fifty Kilometers of shoreline) of lake fishing on the world-renowned Lady Evelyn Smooth water System. With access to over one thousand eight hundred and ninety six miles of “world class” snowmobile trails, snowmobiling and ice fishing are at your disposal. With hectares of untouched wilderness cross country skiing and snow shoeing is magnificent. Access to several remote outback lakes filled with pickerel (walleye), small mouth bass, pike, perch, whitefish, speckled trout, and lake trout, makes for peaceful days on the water. Mowat Landing Cottages is your four-season getaway destination. A network of four-season trails entices many recreational motorsports experiences, as well as hiker’s and bikers for the outdoor adventurous. So whether you enjoy fishing and hunting, outdoor adventures, recreational motorsports (access to over 1800 miles of trails), or are just in need of some family time, we have all your unique opportunities to enjoy the wilderness. The wilderness experience is why everyone lands at Mowat Landing Cottages.